For the first time ever, there are now more Canadian seniors over the age of 65 than under 15. Overall, the effects of Canada’s aging population put a lot of strain on the healthcare system, as well as the pension system. In this way, the benefits of home care services are wide-reaching, benefiting not only seniors and families, but also alleviating the burden on the economy. We will take a look at the growing benefits of home care services below. Home care services are designed for many people, from the chronically ill to seniors to disabled patients. They receive high-quality care from professionals; the services can be personalized and tailored to exactly what they need. Further, these services are much more affordable than those who are receiving inpatient care. However, inpatient care becomes more likely as at-risk individuals continue to live on their own without the help they need. 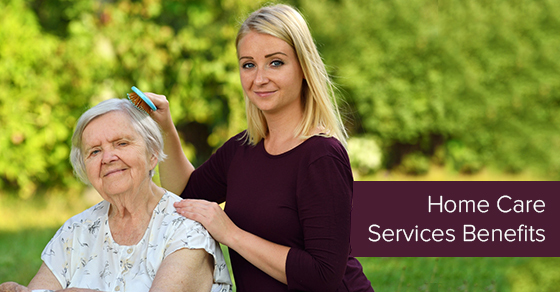 Home care services allow individuals to remain at home where they are most comfortable. This is paramount to their emotional health and ultimately their physical health, too. For example, since home care services make it easier for family and friends to come and visit, this reduces social isolation and in turn, increases their emotional well-being. When it comes to seniors living at home, the goal is to stay at home for as long as possible and home care services allow them to retain their independence. Those who are recovering from an illness also statistically heal faster at home than in a hospital. Home health care services greatly benefit the individual’s health. For example, they will be at a decreased risk of suffering from infections when they are receiving care at home instead of in a hospital. Statistically speaking, they are re-admitted to the hospital much less than their counterparts who do not receive home care services. Not only do home care services benefit the individual receiving the care, but they also offer numerous benefits to the family. For families who don’t have a primary family caregiver, families often feel overwhelmed and stressed out when it comes to figuring out who will take care of what. Home care services can allow the family to feel a peace of mind and sense of reassurance knowing that their loved ones are being taken care of. Home care services alleviate the burden on family caregivers. Home care services benefit the economy by alleviating hospital-related costs.